If you have a tip, contact us through text message or Signal at 518-727-7885, or via email at jlynch@fifthdomain.com. 12:41 a.m. — Quiet Election Day early sign of cyber policy success — Officials monitoring the U.S. midterm elections have seen no significant hacking attempts, a sign that foreign countries sat out the 2018 vote. The Department of Homeland Security was worried that Russia and other countries were biding their time for an Election Day surprise. However, there is no evidence that came to fruition, according to an agency official. Still, DHS monitored general misinformation that tried to sow discord and disrupt Americans faith in the democratic process, according to the agency official. While U.S. officials will offer a final judgment on the fate of the 2018 midterm vote in 45 days, the preliminary result is a positive sign for the Trump administration’s new cyber plan. Before the midterm vote, top Pentagon officials said that the election would be one indication of the new plan to take more offensive cyber operations was successful. 4:05 p.m. — Homeland Security sees intentional disinformation efforts, no widespread hacking — While they see no widespread effort to hack the midterm elections, the Department of Homeland Security has seen both intentional and unintentional disinformation efforts as it monitors the voting process, according to top agency officials. Examples of the intentional disinformation campaigns include more than 100 social media pages that were removed for inauthentic behavior, DHS Undersecretary Chris Krebs said during a press conference. Krebs said that social media companies have taken down the false information. Despite the spread of fake news, DHS says it is not aware of any widespread hacking efforts. “This is the most secure election in the modern era,” Homeland Security chief Kirstjen Nielsen during the press conference. Nielsen declined to elaborate on why foreign countries, particularly Russia, have not taken substantial efforts to sway the midterm vote. The Pentagon is standing by with teams to assist if necessary, Nielsen said. Inside the agency’s operations center, officials from both the Democratic and Republican Party were present, alongside military and Homeland Security officials. Television stations inside the bland conference space were fixed to CNN. Officials monitoring the vote appeared relaxed, joking with reporters and listening as Nielsen spoke. However, down in the agency’s classified National Cybersecurity & Communications Integration Center, officials quietly browsed their computers for digital attacks uncoiling across the world. The windowless room was nearly quiet as Homeland Security officials gazed into their computers to search for the latest threats. A series of red blinking lights notified the officials inside the room to be on alert — reporters were in the normally secure space. 3:30 p.m. — Old machines cause delays — Voter protection volunteers working at polling locations across the country report that old machines prone to breaking down or experiencing bugs during voting have caused problems in many precincts and slowed down lines at polling places. Some locations were forced to open late as a result of malfunctioning machines. Experts from Common Cause, a grassroots organization that works to support voters on election day, said that these problems are attributable to known bugs and mechanical failures, but malicious actors wouldn’t necessarily have a hard time changing results through malware. Electronic voter rolls have incorrectly listed some voters as having already voted absentee, which required checking against other databases and prolonged voting times. Many locations are also struggling with new poll workers who have incorrectly told people that they cannot vote or must cast a provisional ballot. These issues combined increased wait times in many locations, including around Atlanta, Georgia, where wait times averaged three hours. 1:55 p.m. — DHS monitoring continues — Election security officials monitoring the midterm vote have seen the scanning of state election infrastructure, which they say is a normal event they expected. The Department of Homeland Security is monitoring technical glitches, but have seen no substantial election security events so far. 11:13 a.m. — Inside Homeland Security’s Election Day efforts — The Department of Homeland Security says they have been preparing for two years to protect the midterm elections. Will it pay off? 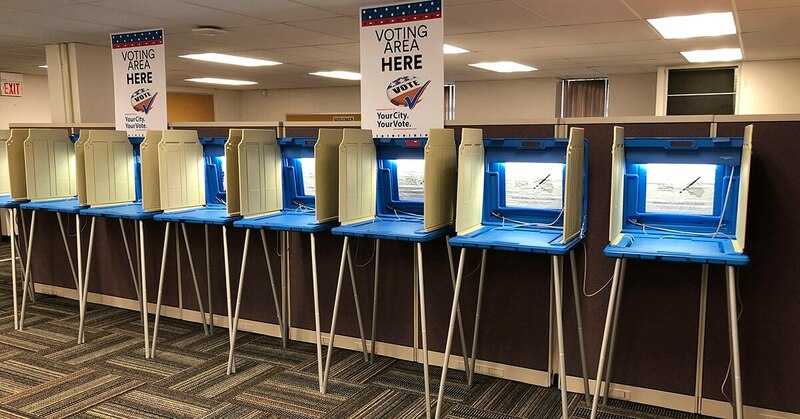 The agency has been in an “enhanced readiness posture” since Sept. 21, adding dedicated personnel and tracking voting information as part of their election security effort, according to a DHS official. On Election Day morning, roughly 20 states were logged into the agency’s situation awareness room, according to the DHS official, a number that was expected to fluctuate as the day goes on. The agency has several hundred people out in the field to protect the midterm vote, and has an official in every state. Intelligence officials say that they have worked hard to communicate more with local governments and share potential threats. DHS officials say that local and state websites are the most reliable source to receive polling place information. We have had some reports of voters receiving incorrect polling place information from 3rd party applications. Please remember to use https://t.co/PCoaynlMHC for the most up to date information. 9:27 a.m. — DHS sees uneventful start to midterm vote, concerned about fake news — In an early sign that the midterm vote is not seeing the kind of widespread disinformation efforts that were witnessed in the 2016 presidential election, a Department of Homeland Security official said hours after the polls opened on the East Coast that there is nothing significant to report regarding election security incidents. However, the official warned that foreign countries and Russia are continuing to spread disinformation with the goal of creating mistrust. The agency is more concerned about someone falsely claiming to have hacked voting tallies to spread sentiments that the results are tainted. A sign of the increased preparation for the midterm vote is the actions of Facebook, the DHS official said, which took down more than 100 pages just hours before the polls opened on Election Day. 11:30 p.m. — Facebook shuts down pages spreading disinformation at request of US authorities — Social media network Facebook said that it has taken down more than 100 pages that “may be engaged in coordinated inauthentic behavior” after first being notified by U.S. law enforcement just hours before voting beings. Facebook identified and blocked around 30 Facebook accounts and 85 Instagram accounts, the company said in a statement late Monday night. Most of the Instagram accounts were focused on celebrities and political debate, according to the company. “Given that we are only one day away from important elections in the US, we wanted to let people know about the action we’ve taken and the facts as we know them today," Facebook said in a statement. Facebook’s action come after the company has taken down hundreds of pages that originated in Iran and Russia that have focused on spreading disinformation. 7:54 p.m. — Top Trump officials warn Russia, other nations trying to sway sentiment — Although top Trump administration officials see no evidence that election infrastructure has been compromised, they are warning hours before polls open for the midterm vote that Russia and other countries are trying to sway public opinion. “Americans should be aware that foreign actors — and Russia in particular — continue to try to influence public sentiment and voter perceptions through actions intended to sow discord,” DHS Secretary Kirstjen Nielsen, Attorney General Jeff Sessions, Director of National Intelligence Dan Coats and FBI Director Christopher Wray said in a joint statement. The officials said that Americans should get voting information from state and local election officials, and be cautious when reading election-related information. 3:55 p.m. — Illinois fears election day disinformation — While top election officials in Illinois have expressed confident that they have taken preventative steps to avoid a voting-day nightmare, there is a fear last-minute hacks could lead to the spread of disinformation and dissuade voters. The Illinois State Board of Elections believes one nightmare scenario involves a hacker penetrating a county website and either posting false information that polling places have been closed or reporting fake results to spread mistrust, Matt Dietrich, a spokesman for the state agency, told Fifth Domain. While there is no public evidence that hackers plan on spreading this type of disinformation, top federal officials also say this particular scenario is a possibility. Dietrich also said that the board of elections fear a ransomware attack on its voting data system. During the 2016 campaign season, the Illinois electronic voter registration database was breached by a cyberattack. Since then, the state board has added additional firewalls, hired new IT staff and conducted election security training. Illinois has also received more than $13 million for election security through the Help America Vote Act. 2:08 p.m. — DHS official: Russia pushing fake news during midterm vote — Russia is using disinformation and influence operations to spread fake news during the midterm elections, according to a top Department of Homeland Security official. The Russians are pushing messaging about compromised systems in the state of Texas that is “just not true,” Christopher Krebs, undersecretary for the DHS National Protection and Programs Directorate, said on CBS This Morning. Krebs said a Boston Globe report alleging that the federal government has logged more than 160 reports of suspected meddling since Aug. 1 is evidence of better coordination with state governments. “It is a roll up of things that are happening on a daily basis,” Krebs said, describing many of the hacks as typical phishing and scanning attempts. “I’d caution to call these attacks,” Krebs said, adding DHS has not attributed these hacking efforts to a nation state. 1:24 p.m. — Georgia to conduct criminal investigation into hacking claim — The Georgia Bureau of Investigation will conduct a criminal investigation into allegations of cybercrimes by Secretary of State and Republican gubernatorial candidate Brian Kemp, a spokeswoman for the Georgia agency told Fifth Domain. The investigation was requested by the secretary of state’s office, Nelly Miles, a spokeswoman for the Georgia Bureau of Investigation, said in an email. Kemp’s office has not offered any evidence of his claim regarding a potential hack on the Georgia registration database, and has refused to recuse himself as secretary of state, a position that oversees the election effort. 12:25 p.m. — How US intelligence agencies reformed after 2016 hacking — The U.S. government was caught off guard by Russia’s hacking efforts during the 2016 elections, current and former U.S. intelligence and White House officials have told Fifth Domain. To be clear, there is no evidence that the vote tally was changed during the 2016 elections. Instead, U.S. government officials say that Russia hacked the Clinton campaign and weaponized information through leaks to sway Americans perceptions. Since then, the U.S. intelligence community has started a new election security task force, boosted collaboration with local officials and has taken offensive cyber operations. The creation of the NSA’s election security small group this May was meant to monitor foreign government’s actions during future elections. Information from the task force is then given to the Department of Homeland Security and FBI, who works to update local election officials. The NSA has also taken offensive operations “in connection with defending the integrity of our electoral process and defending the overall integrity of our information technology systems,” national security advisor John Bolton said Oct. 31 during an event at the Alexander Hamilton Institute. Some former intelligence officials have told Fifth Domain that the changes have not been strong enough and blame an absence of executive leadership. The intelligence community believes that it is difficult to compare the threat of election interference in the midterm elections with the 2016 presidential vote, because adversaries and the U.S. government’s tactics have changed. But American intelligence officials say foreign countries are trying to sow discord and undermine faith in the democratic process, and their midterm activity could be preparation for the 2020 election. 10:54 a.m. — DHS refers Georgia hacking claims to state — An official from the Department of Homeland Security told Fifth Domain the agency has been notified of an accusation of a potential hack on the Georgia registration database, and are deferring to the state for further details. The office of Georgia Secretary of State and Republican gubernatorial candidate Brian Kemp has, without citing evidence, opened an investigation into the Democratic Party of Georgia for “failed efforts to breach the online voter registration system.” In a Nov. 4 statement, Kemp’s office requested the FBI investigate the claims, and said the secretary of state’s office would be working with private-sector vendors and investigators to review data logs. Kemp has refused to step down from his role as secretary of state, the office which oversees the elections. A spokesperson for the FBI and the Georgia Secretary of State office did not immediately return requests for comment. Kemp was one of the few secretaries of state who refused support from the Department of Homeland Security during the 2016 elections. Former Homeland Security officials have told Fifth Domain that when DHS tired to persuade Kemp to accept federal support, the Georgia secretary argued that the federal government was trying to take over local elections.